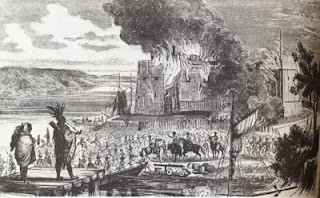 For the last two weeks, we've been covering the events of the summer of 1758. Last week, we saw the British finally beginning to turn things around with a victory at Louisbourg and Frontenac. More importantly, the British finally convinced most the Indians either to side with Britain, or at least quit fighting for the French. At the same time all that was happening, Gen. Forbes was slowly making his way toward Fort Duquesne. John Forbes was born in Scotland in 1707. His father, also an officer in the British Army, died before he was born. Forbes started began his career in medicine, but decided life as a doctor was not for him. At the relatively late age of 28, he purchased a commission as a Cornet in the British Army. Forbes saw combat in several wars, including crushing his fellow Scots at the Battle of Culloden. In the War of Austrian Succession, he served as aide-de-camp to Sir John Ligonier. Later he served as Quartermaster General for the Duke of Cumberland’s army. It was almost certainly his relationship with Ligonier, now Commander of all British armed forces that accounted for his promotion to General and his independent command to take Fort Duquesne in 1758. Col. Washington and others tried to encourage Forbes to consider a faster route from Virginia, along the Monongahela River as Gen. Braddock had taken three years earlier. This route would save time as it would not require building a whole new road through forests and over mountains in territory teeming with hostile Indians. Forbes dismissed this advice as provincialism. He thought Virginia’s concerns about his course were that his road would tie the Ohio Valley to Pennsylvania and threaten Virginia’s claims to the land. He was not wrong on this point. The road he eventually cut helped secure Pennsylvania’s claims to the land as far west as Pittsburgh. His road, later called Forbes Road, became the main route west to the Ohio Valley. It followed roughly what eventually became part of the Lincoln Highway in the early 20th Century. Forbes did not want to make the same mistakes as Gen. Braddock, whose forces could not easily retreat with heavy equipment after the loss at the Battle of the Monongahela. 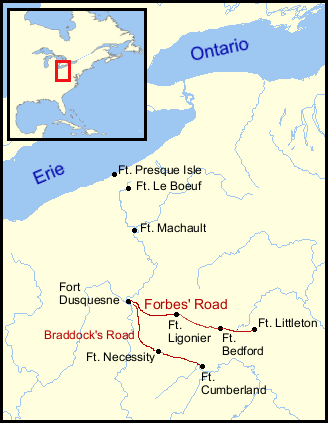 Forbes’ road allowed the British to maintain their supply lines back east to Philadelphia. If a retreat was necessary, they would not need to abandon their equipment. It was slower but safer decision. The Virginians were right, however, that actually building the road would take the rest of the year. After Forbes hit the mountains of Western Pennsylvania, forward movement slowed to a crawl. It probably did not help that Forbes was suffering from a terrible debilitating disease that was making his work all the more miserable. To further secure the supply lines to his base in Carlisle, Forbes constructed a chain of forts along his new road: Littletown, Bedford, and Ligonier roughly 40 miles apart. 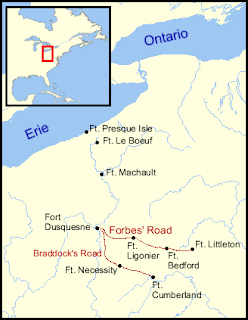 Forbes established his final Fort, Ligonier, in August 1758, about 50 miles from Fort Duquesne. Indian raids on the British line of forts, and any supply trains travelling between them, forced the offensive to go on the defensive and hunker down. In September, Forbes deployed 800 men under the command of Major James Grant toward Fort Duquesne. Grant hoped to conducting a surprise raid, or at least gain more intelligence on the site. Instead, the French and their Indian allies received word of the advance and ambushed the British. The killed wounded or captured nearly half of the British force, including Maj. Grant who was taken prisoner. The remainder fled back to Fort Ligonier with horrifying stories of the ambush. Back at Fort Ligonier, Forbes had about 6000 men, including 2000 regulars, to assault Fort Duquesne. After Grant’s failed raid though, he was reluctant to try anything further. With so many hostile Indians, Forbes quite rightly feared that his forces would suffer fatal ambushes before they could even reach the Fort. Summer turned into fall without any further advancement as Gen. Forbes spent his time trying to make use of Indian allies to improve his chances of a successful assault. While Tribes in the Ohio Valley and Pennsylvania were still siding with the French, Forbes attempted to bring on allies from the Cherokee further south. More than 1000 Cherokee warriors joined Forbes in preparation for a final assault on Fort Duquesne. Forbes, however, tried to treat the Cherokee as subordinates rather than allies. The Cherokee were not going to submit to military regulations or even take orders from the Regulars. The Indians fought as allied auxiliaries, or not at all. Forbes thought he could get the Cherokee to do otherwise. Instead, almost all the Indians ended up leaving Forbes, taking with them the guns and ammunition he had provided to them. As the armed Cherokee returned south, they ended up having more problems with colonists that led to even more fighting. We will take a look at that in an upcoming episode. It looked as if Forbes’ advance had come to a complete halt and that his campaign for the year would be a failure. Then, by late October, word of the Treaty at Easton that I discussed last week, reached Western Pennsylvania. As word of the Easton agreements spread to the western Indians, the local tribes accepted the change overnight. By early November, all local Indian raids had stopped. More distant tribes had already gone home for the end of the summer season. Ironically, the September attack on Maj. Grant had provided most of the warriors with the booty and honors they sought, so they packed up and went home. That was exactly what frustrated European officers most about dealing with Indian allies. The French commander at Duquesne now had his supplies cut off from the Great Lakes. Most of his Indian allies had abandoned him. He had only a token force at the Fort which could put up no serious defense. He convinced several loyal Indians to conduct one final raid on the British to take their cattle. Forbes sent out the 1st Virginia Regiment under Col. Washington and the 2nd Virginia under Lt. Col. George Mercer. Washington caught a few of the raiders, but then ran into Mercer at dusk. Each regiment mistook the other for the enemy and opened fire, killing or wounding two officers and 38 men. Despite this accident, the prisoners captured prior to the firefight provided valuable intelligence about the desperate circumstances at Fort Duquesne. With that information, Forbes began his final advance on the Fort. They were about 12 miles from the Fort when the heard the explosion on November 23. The French commander had removed all men and supplies from the fort. He then used his gunpowder to blow up the walls in order to render it useless to the enemy. The few hundred remaining French troops traveled upriver to Fort Machault to wait out the winter. Forbes now took control of the smoldering ruins. With the militia’s enlistments scheduled to end in less than a week. Forbes worked to throw up a new Fort for a winter occupation. He named the new Fort after William PItt, the man in London who was in charge of the war. And so, Fort Pitt, soon to be called Pittsburgh, was born. Sadly, Forbes’ continuing medical problems only got worse. 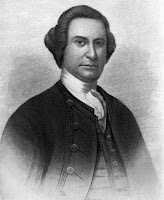 His second in command Col. Henry Bouquet had to manage a Dec. 4 assembly with local Chiefs that assured them that their lands would be protected by the Treaty of Easton. Forbes headed back to Philadelphia for medical care. He died a few weeks after arriving in Philadelphia, receiving a hero’s funeral. His enduring legacy would be Forbes Road, which his men had cut through Pennsylvania. It opened up the west for trade and settlement. Despite the victories of 1758 at Fort Louisbourg, Fort Frontenac and Fort Duquesne, Britain recalled Gen. Abercromby that winter. His failure at Fort Carillon had led to too much criticism. Despite his recall, he would receive promotion to Lt. General in 1759 and eventually rise to the rank of full General. He also became a Member of Parliament and would be a strong supporter of coercive measures against the colonies. Gen. Amherst, the hero of Louisbourg, would take command of British forces in North America. He would implement London’s strategy for the 1759 fighting season. Also at the end of the 1758 fighting season, Col. Washington headed home, having finally completed his objective of establishing British control of the Ohio Valley, after nearly five years. 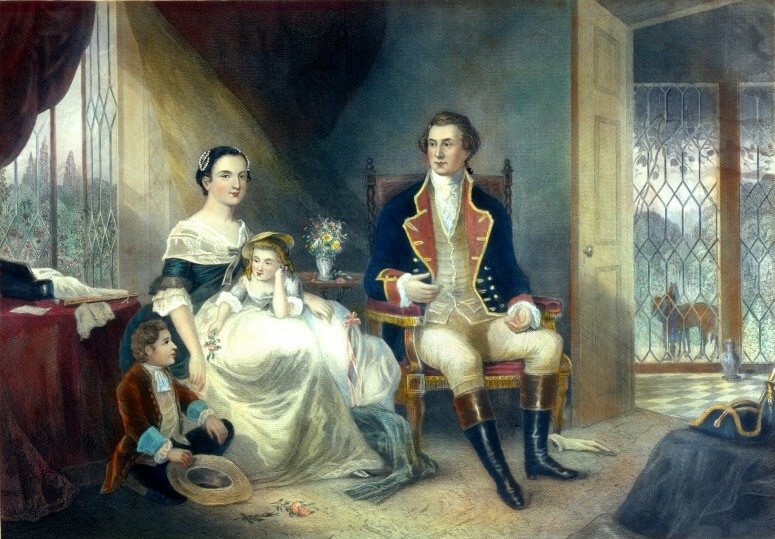 On January 6, 1759 at age 27, Washington married 27 ½ year old widow Martha Custis, a young widow who was beautiful, rich and had huge...tracts of land, making him instantly one of the largest and wealthiest landowners in Virginia. In the summer of 1759, he entered elected politics as a member of the Virginia House of Burgesses. Washington would remain a militia officer, but he was putting his active military years of service behind him. His new focus would be as a plantation owner and politician, as well as father to his two new step children. The military and diplomatic reverses of 1758 now put momentum in Britain’s favor. The Iroquois left behind any pretense of neutrality. The fear that the Delaware and Shawnee might unite in an independent confederacy against the Iroquois prompted them to get fully on board with the British. Through the summer of 1759, the British were building a large fort and trading post at Fort Pitt, along with a settlement called Pittsburgh. More trade began arriving from Pennsylvania. The local Indians appreciated the supplies and ability to trade, but were also concerned. If you English are really going to leave this area as promised, why are you building this giant Fort and this big English settlement right next to it? The Iroquois told the English there was a danger of the local tribes in the Ohio valley moving back to the French, which would harm both Iroquois and British interests. Therefore, the Iroquois wanted to assist with the final push to get the French off the continent. The French still occupied Fort Carillon, where Gen. Montcalm had defeated Gen. Abercromby the year before, The French also held Fort Niagara. The commanding Gen. Amherst focused on these two targets as the keys to a winning season in 1759. 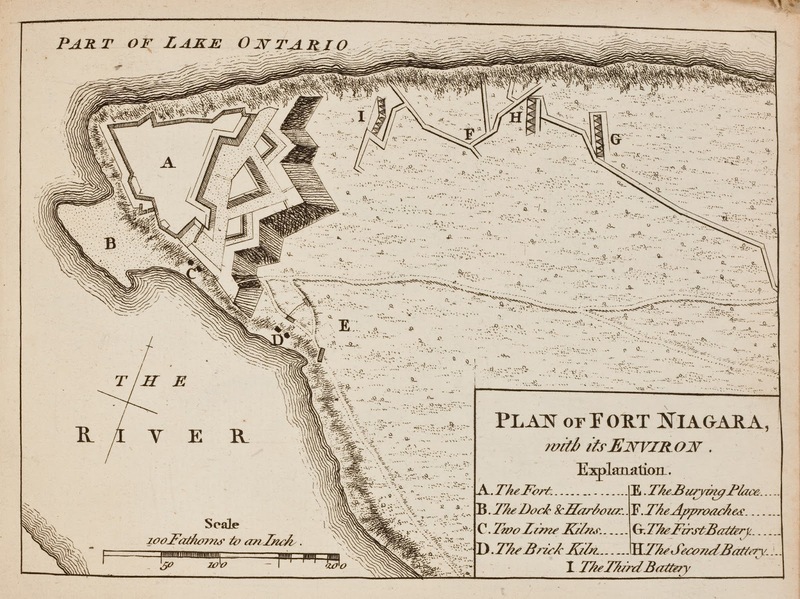 The French still held Fort Machault just north of Fort Pitt and south of Lake Erie, threatening the Ohio Valley. But Amherst knew that taking Carillon and Niagara would cripple those smaller front line Forts without hope of supplies or reinforcements. There was also the fortress city of Quebec to contend with, but that was Gen. Wolfe’s problem, one I’ll discuss next week. As Amherst prepared his forces for the summer 1759 fighting season from Albany. He received more than 20,000 militia from various colonies, still paid for with British gold from London. These complemented the more than 8000 regulars at his disposal. Gen. Johnson, also came forward with around 1000 Iroquois warriors from all six nations. Amherst deployed Gen. John Prideaux with about 3000 regulars and 2000 militia, along with Johnson and his 1000 Iroquois to take Fort Niagara. This was no easy task. The Fort was one of the best built forts on the continent, with a highly capable military engineer, Captain Pierre Pouchot commanding the defenses with about 3000 French regulars and militia. Pouchot also had a strong relationship with the local Seneca who served as lookouts for any attack and allies to assist with the fort’s defense. Pouchot, however, made two fatal mistakes. First, by mid-summer he figured the threat to any attack had passed. He reasoned, correctly, that the best time for an attack was in the spring, before the smaller winter garrison was reinforced. The attack did not come until July, after Pouchot has dispatched 2500 of his 3000 defenders to Fort Machault to take part in a French offensive to retake the Ohio Valley. Second, he assumed his Seneca allies would give him plenty of advance notice of any attack. his Seneca allies were also members of the Iroquois Confederacy, which he did not learn had decided to side with the British that year. Pouchot had a good working relationship with the local Seneca, despite whatever strains existed between Gen. Montcalm and the other tribes. It was true that the local Seneca remained loyal to him. The rest of the Iroquois, though, were now backing the British and did not pass along any warnings to them that an attack was coming. Therefore, Pouchot was shocked when he learned about the British landing a few miles from his Fort on July 6, 1759. He knew he had to play for time as the British began to set up artillery entrenchments for a traditional siege. He sent the local Seneca Chief out under a flag of truce to try to get the 1000 Iroquois marching with the British to leave the fight. But the Iroquois under Johnson were adamant that this had to be done. To sweeten the deal, Johnson promised his warriors the opportunity to plunder the Fort once it was taken. Ultimately, after eight days of negotiation, the Seneca Chief decided to remove warriors from the French lines and head north. While Pouchot regretted losing them, he also did not want warriors on his lines of defense who might have issues with killing their Iroquois brothers on the other side. During the eight day truce, the British were not just standing around. They had continued to entrench artillery now just 250 yards from the Fort’s walls. Pouchot’s only hope was that the defenders he had sent to Machault received his message to return and would arrive in time. On July 23, a relief force came within sight of the Fort. The British, though, were ready for them. The leaders of the Iroquois fighting with the British met with the 1000 indians in the French relief force and convinced them that the battle would just get them killed. Those forces wisely broke off and went home. That left just the French regulars and militia to try to break the British lines and enter the Fort. Some sources say this was about 600 soldiers. Others say it was about 1100. In any event, the relief forced faced somewhere between 2200 and 2900 British soldiers and militia, along with the 1000 or so Iroquois auxiliaries fighting with them. The British and Iroquois cut down the French relief force, killing or capturing most, with the remainder fleeing into the woods. Two days later, on July 25, Captain Pouchot surrendered the Fort to Col. Johnson. The British commanding General Prideaux had unfortunately stepped in front of a mortar during the siege and lost his head, leaving Col. Johnson in charge. The British took the French garrison prisoner and shipped them back to Albany. The Iroquois restrained themselves from any massacre and contented themselves with looting the Fort itself. Johnson headed back to Fort Oswego, leaving a detachment to garrison Fort Niagara. 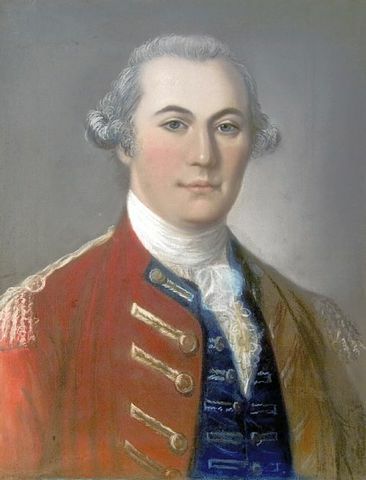 Amherst would soon send Gen. Thomas Gage there to oversee control of the whole western Great Lakes region. 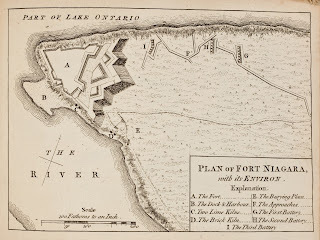 As Amherst predicted, the French had to abandon their three remaining Forts below Lake Erie as they could no longer be supplied or reinforced. So French forces who had retreated from Fort Duquesne, kept on retreating all the way back to Canada. As Prideaux and Johnson were capturing Fort Niagara, Amherst simultaneously led the attack against Fort Carillon. Amherst led over 11,000 regulars and militia slowly and methodically, building up the defenses at Fort Edward, rebuilding a new Fort George near the site of Fort William Henry at the southern tip of Lake George. On July 22, Amherst arrived at Fort Carillon and began entrenching his siege cannon. The French commander with his 400 man garrison, seeing that the British force of 11,000 was conducting a proper siege this time rather than a foolhardy frontal assault, blew up the Fort and retreated up to Fort Saint-Frédéric. When Amherst advanced on Saint-Frédéric a few days later, the French once again blew up the fort and retreated. Amherst was reluctant to chase the French up to Montreal. Without knowing what Wolfe was doing in Quebec, he feared he could easily stumble across a French relief force. Therefore, he focused his attention on rebuilding two new forts. The Fort Ticonderoga replaced Fort Carillon. Fort Crown Point replaced Fort Saint-Frédéric. By August, Amherst had already achieved his objectives for the year and saw no reason to endanger his gains through continued offensives without good intelligence. Better to end the year on several big wins for the British. At that point, he settled into winter quarters early and reported the year’s victories back to London. Next week: Gen. Wolfe takes Quebec. Fort Duquesne and Fort Pitt, by DAR, Pittsburgh Chapter (1899). Oration Delivered at the Centennial Celebration of the Evacuation of Fort Duquesne, by Andrew Loomis (1859). The Papers of Sir William Johnson, Vol. 10, by Hamilton Milton (Ed.) (1951). Memoir Upon the Late War in North America, Between the French and English, 1755-60, Vol. 1, & Vol. 2, by Pierre Pouchot (1866). A Brief History of Old Fort Niagara, by Peter Porter (1896). The Canadian Iroquois and the Seven Years' War, by D. Peter MacLeod (2012). 1759: The Year Britain Became Master of the World, by Frank McLynn (2005). Letters of General John Forbes relating to the Expedition Against Fort Duquesne, by Gen John Forbes (Author), Irene Stewart (Compiler) (2016).